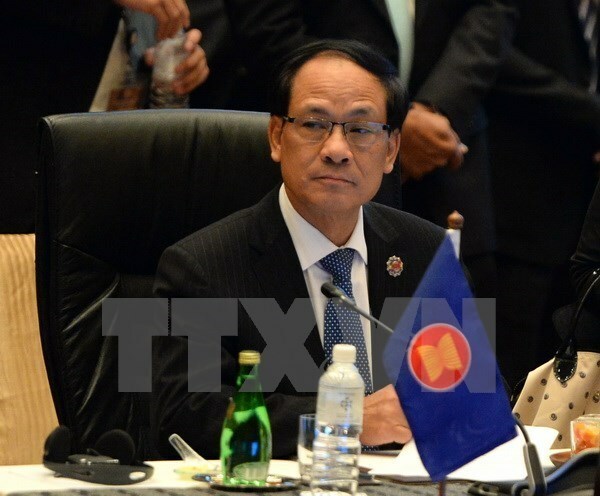 Hanoi (VNA) – ASEAN Secretary General Le Luong Minh highlighted the bloc’s milestones during its 50 years of existence in an interview with Vietnam News Agency. Minh told reporters that the Association of Southeast Asian Nations (ASEAN) was established in 1967 with only five members, Indonesia, Malaysia, Thailand, Singapore and the Philippines. The purpose at that time was to deal with security-related risks amid the Cold War and the anti-US war in Indochina. The bloc then admitted Brunei in 1984, Vietnam in 1995, Laos and Myanmar in 1997 and Cambodia in 1999. These moves completed its initial target of connecting all Southeast Asian countries which are diverse in political institution, economic structure, cultural identity, language and religion. In 2003, the bloc issued the Declaration of ASEAN Concord II identifying the objective of establishing an ASEAN Community with three pillars of politics-security, economics and culture-society, Minh said, adding that the ASEAN Charter in 2007 created a legal foundation and institution framework for strengthening regional connectivity and for establishing the ASEAN Community in 2015. The most important milestone in ASEAN’s history was the establishment of the ASEAN Community in December 2015 and the launch of the ASEAN Vision 2025 towards a self-reliant, legal-binding and people –centered community on January 1, 2016, he added. Mechanisms including the ASEAN Regional Forum, East Asia Summit and Asia Plus Three are important forums for ASEAN countries and others in the Asian-Pacific region to tighten ties and solve tensions which can lead to conflicts, especially those related to nuclear weapons and sovereignty in the East Sea. The central role of ASEAN in these mechanisms contributes to maintaining strategic balance, as well as peace and stability in the region, Minh affirmed. On opportunities and challenges facing ASEAN, Minh stated that the Vision 2025 opens up more opportunities for the ASEAN Community to grow comprehensively and integrate more deeply to gain bigger influence in the world. However, to grasp the opportunities, the community also has to overcome many challenges, including differences in law systems of states, wide development gaps among them and people’s limited awareness of the community. Additionally, complicated developments, especially unilateral actions violating international law in the East Sea, can cause instability in the region as well as disperse resources possibly focused for the countries’ development, he added. Therefore, the secretary general stressed the need for ASEAN to speed up the harmonisation of the member nations’ law systems, balance the nations’ short-term interests with the community’s common and long-term interests, carry out measures and projects to narrow development gaps and raise public awareness of the community.